Making your own Gin Fizz has never been this easy (or fun)! The Tanqueray Champion Shaker has landed in the Fragrant Harbour and man, is it cool. Brought to Hong Kong by Moet Hennessy Diageo, this nifty machine was designed to make the best-textured Ramos Gin Fizzes, ever. Rediscovered and engineered for the modern era by Jason Crawley, the design for the Tanqueray Champion Shaker comes from an almost 200 year-old line drawing of a British "Imperial" Shaker. With the original specimen standing at around 4 feet, Crawley optimised the Champion Shaker to sit atop bar surfaces, to function as an elegant machine as well as Victoriana decor. Obviously, we couldn't say no to test driving this shaker at Mr & Mrs Fox, where it is on display during March and April. 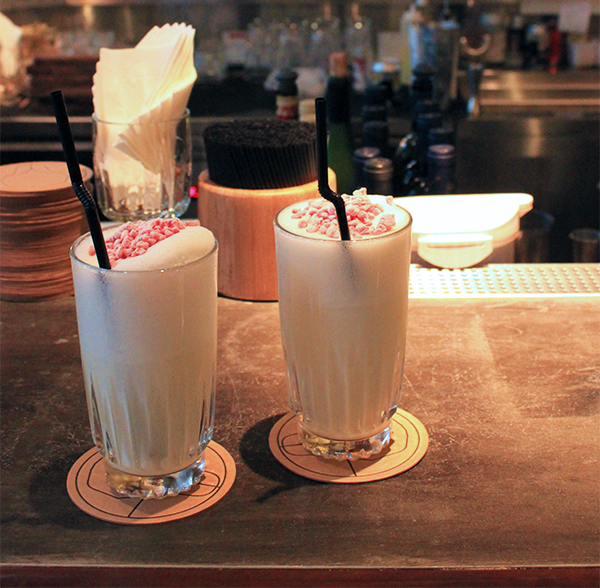 The restaurant welcomes curious patrons wanting to try their hand at making their own Ramos Gin Fizzes, so if you're so inclined, you too can skip on down to Quarry Bay and give it a whirl. You can use it as an excuse to skip arm day on your workout schedule, because oh boy, that machine needs a crankin'! Here's a little bit of history on why this machine was created, and necessary, in the first place: The Ramos Gin Fizz is a classic New Orleans cocktail invented by Henry C. Ramos in the 1880s, and the original recipe required 12-15 minutes of spirited shaking to froth the egg white; the creation of the Imperial Shaker was a god-send, ushered in to lessen the burden on bartenders and reduce the time spent on making the drink. It consists of Tanqueray No. TEN gin, fresh lemon and lime juices, cream, egg white, orange blossom water, and soda. Place all ingredients in a shaker and shake vigorously for 12-15 minutes by hand. If you happen to have a Tanqueray Champion Shaker on hand, this will take only 2 minutes. Alternatively, you can whisk the egg whites in a bowl until frothy and mix in with the rest of the ingredients. Just make sure the egg white is frothy before serving. Top with club soda, orange twist, and a side of raspberries.